We were commissioned by our clients in a detached Somerset residence to make bespoke wardrobes in 2017. 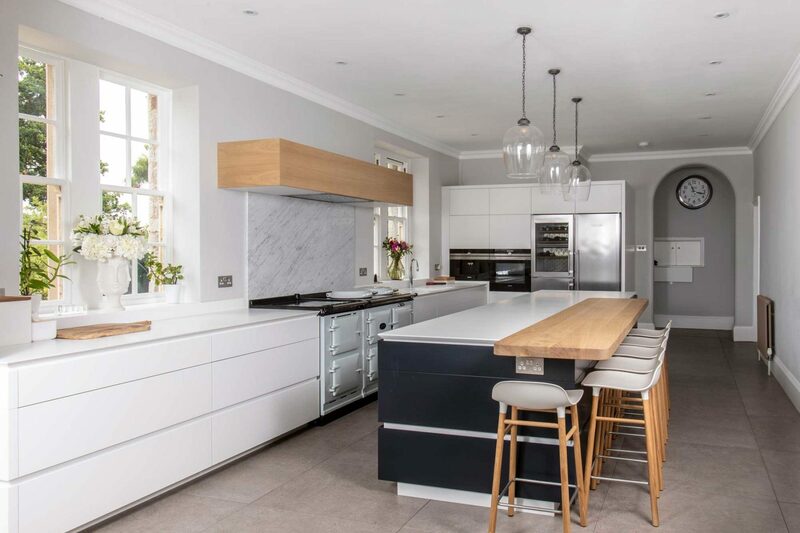 They were delighted with our work and asked us to share ideas on their kitchen space which they were planning for 2018. 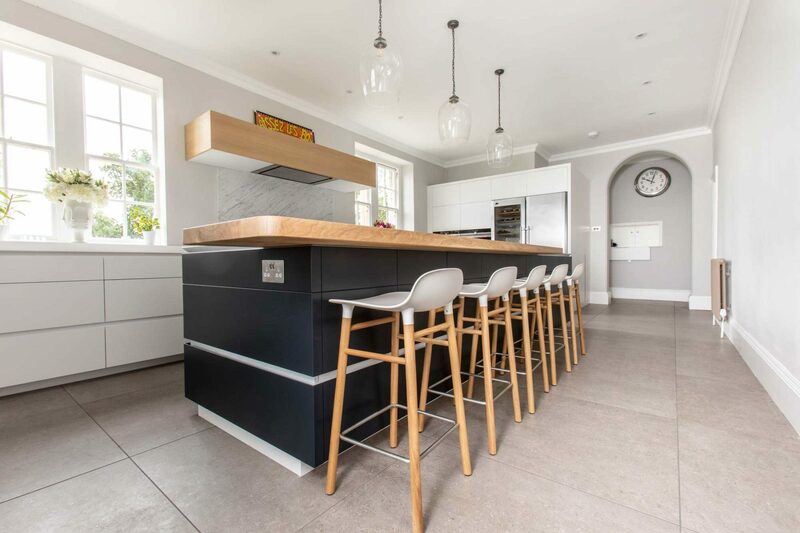 The existing kitchen was long and narrow and very traditional, and divided from the oak orangery at the end of the property. We suggested opening the space up, partly to enjoy the incredible views to the Glastonbury Tor, through the oak gable end. 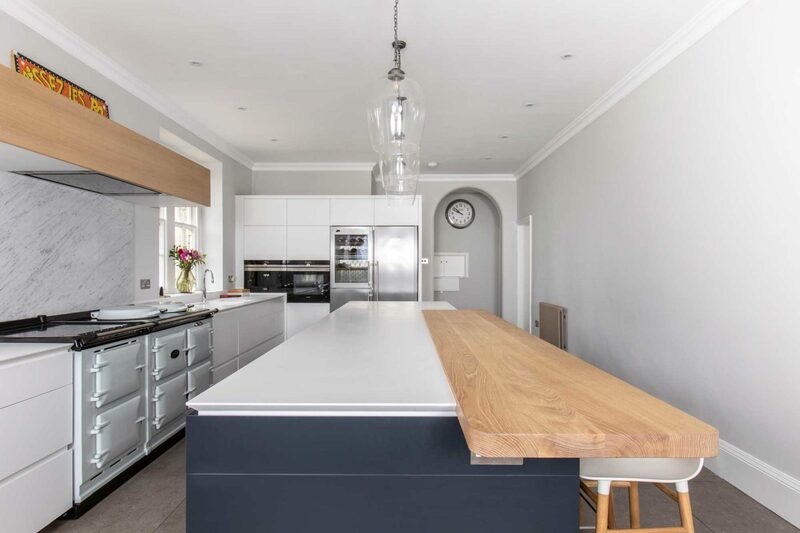 As with all of our kitchens and furniture commissions, we spent a lot of time with our clients reviewing the design plans until perfect. We always consider the availability of light in our spaces, natural and artificial, and this project was no different. 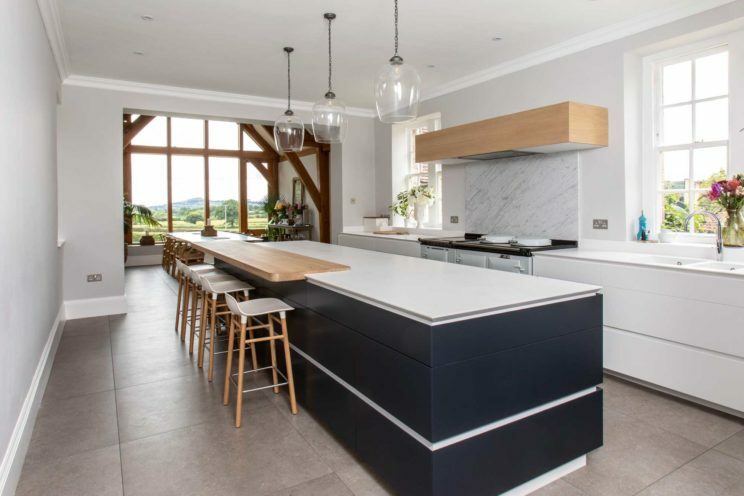 The end of the room featured the gorgeous oak orangery which let in plenty of light and we wanted to emphasise this in the opposite side where the kitchen would be placed. 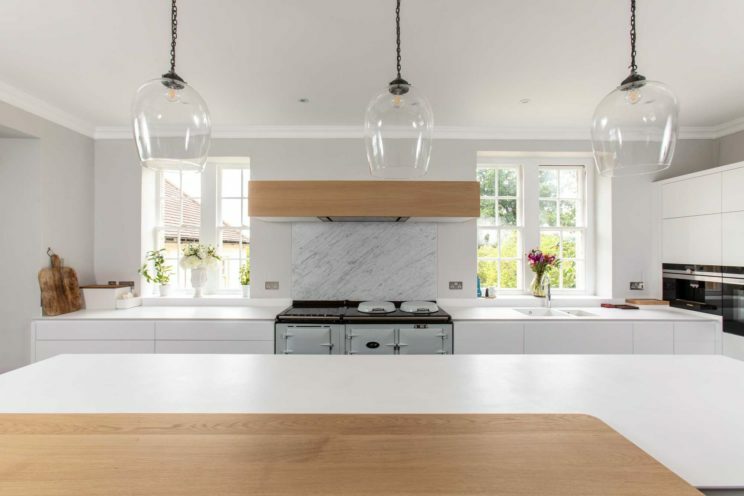 The linear nature of the room and fixed point for the AGA suggested the need for a very large and long island in the middle of the room, rather than planning cabinets along the opposite wall as was previously the case. Our clients had four teenage children and like a good party, so the space needed to serve a social purpose as well as being functional for cooking for a large family. 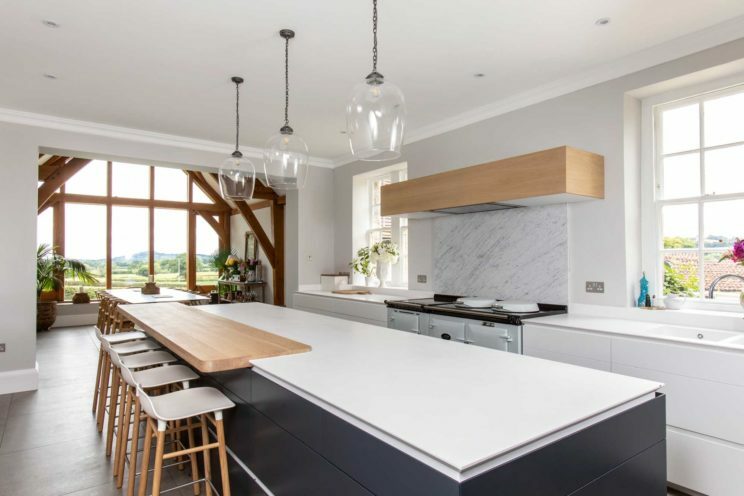 Very large islands raise issues of worktop material choice – all worktop materials, whether stone, granite, marble or quartz, come in certain slab sizes and mean ugly joints. We’re fabricators of Corian here at Bath Bespoke, which is the only material that can be joined invisibly. 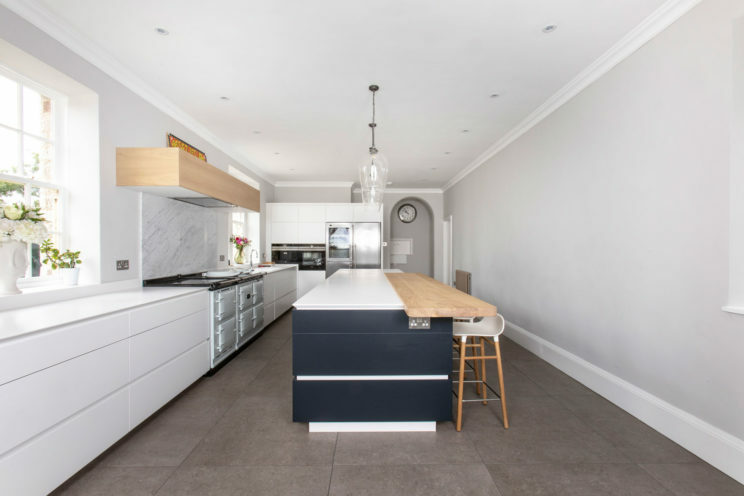 It was the perfect choice for this minimal kitchen design. We specified white which just feels so clean and purposeful. We added a full stave, thick European oak counter top to provide overhang for seating. It feels nice, warm and durable under arms when sitting. The functionality of the kitchen was just as important as the aesthetics. When designing the kitchen, designer and director Tom Jones Marquez paid regular visits to our clients’ home to find out how they planned to use it. Storage was key to the success of the kitchen and so we created an integrated larder cabinet, with two deep drawers and adjustable shelves. These could be moved to accommodate the varying appliances and products our clients owned. 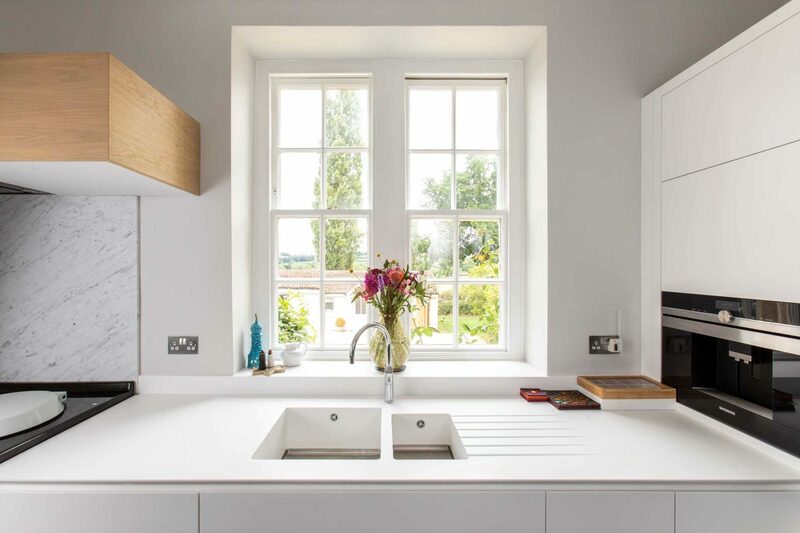 We also incorporated two integrated bin systems, for general waste and recycling and specified integrated moulded Corian sinks, with drainage grooves. 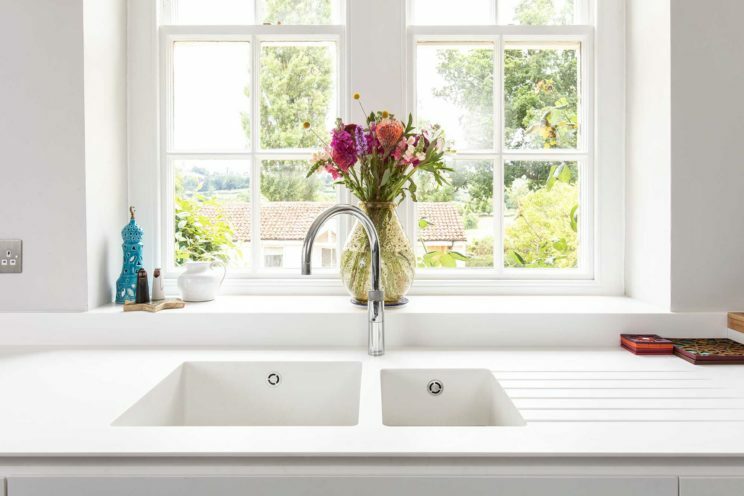 We added ‘sharknose edging’ to the front edges of the worktops which make the top look thin and make it easier to clean. We also used Corian in the shadow gap detailing, an area that takes lots of finger bumps. Corian is much more durable than paint so well placed here. The integrated Siemens coffee machine and oven meant that the space wasn’t too dependent on the AGA in the summer. The wine fridge and fridge by Liebherr provided very functional additions for cooking and drink storage. 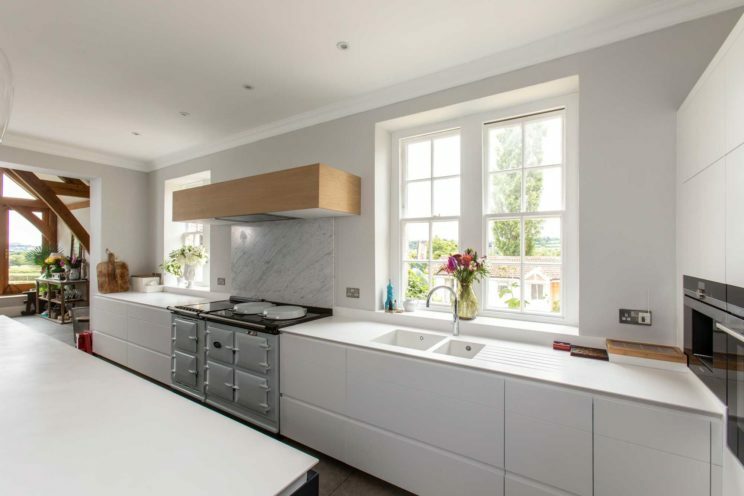 We were delighted when our clients said that their new kitchen exceeded their expectations.